Planners | Print, Cut, Paste, Craft! 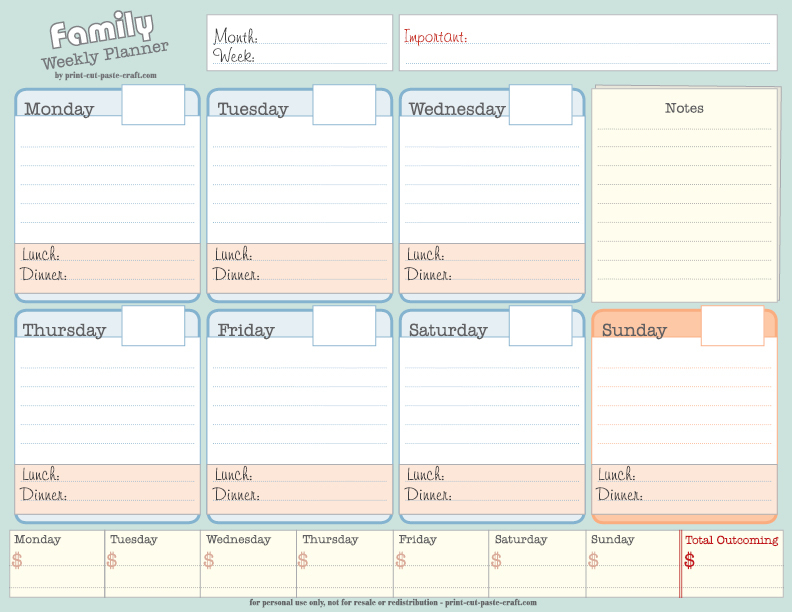 Click here to download the printable PDF of this useful family weekly planner. There is plenty of space for each day of the week, Lunch and Dinner dedicated boxes and a place to record your weekly expenses. Having a good shopping list before getting into the store can save you time and money, and I do like having a well organized list divided sections. That is why I created this free printable shopping list template! 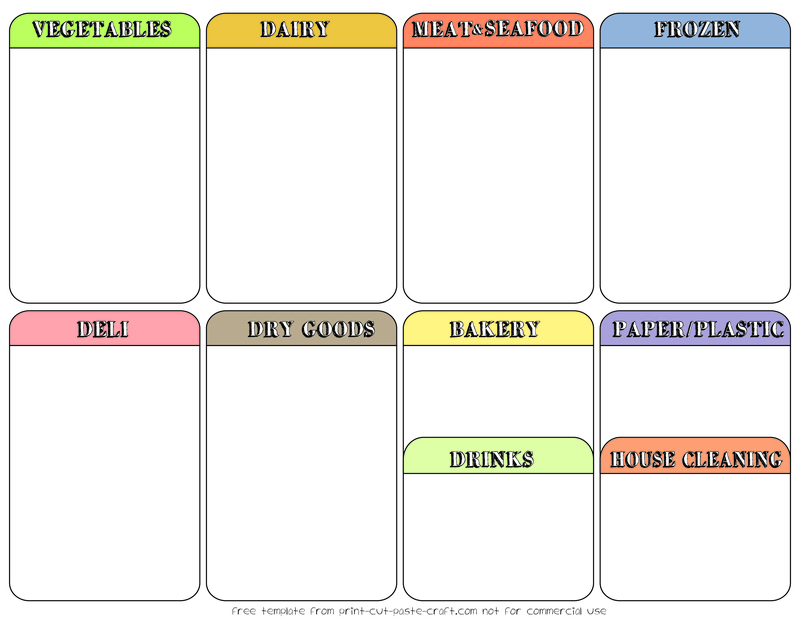 As you can see it is already divided in colorful sections, all you need to do is get the free blank template here, print it and hang it on your fridge or magnetic board! During the week you will be adding all the things you need in the appropriate section and when it is time for a trip to the store just bring it with you! Print a new one and start again the following week. It is that easy! 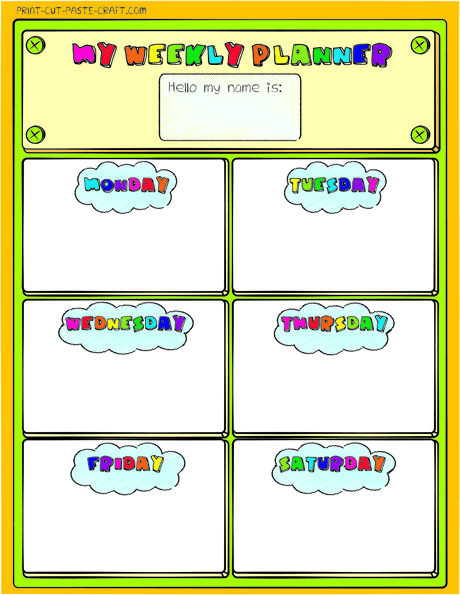 With all the weekly activities kids do during the week, I thought it would be nice to create a weekly planner to help them remember what they have to do during their busy weeks! 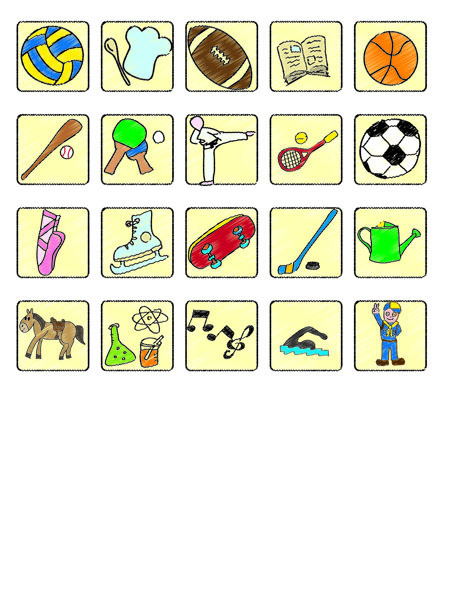 As you can see it is a colorful chart that is designed for those activities that repeat through the season or the year like sports, music, boy scouts etc. 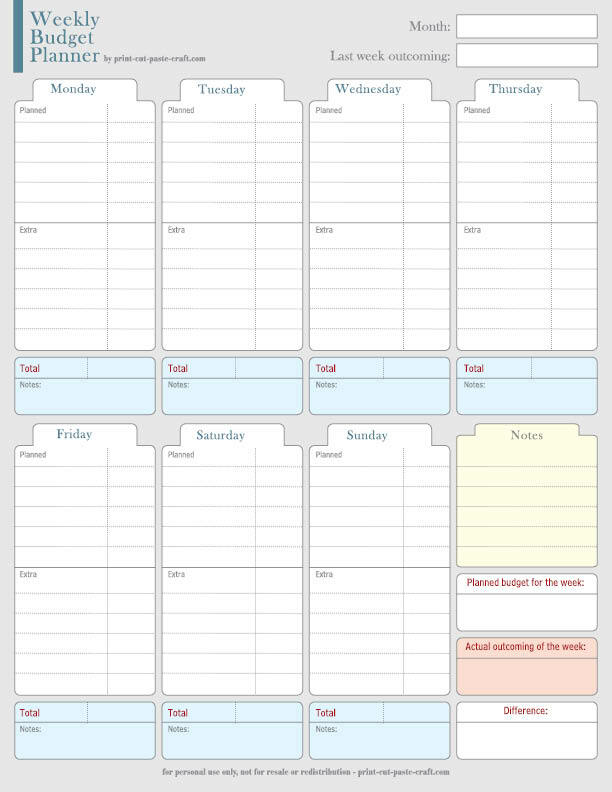 All you need to do is get your free pdf by clicking here, print it on cardstock, cut out the activity stickers and have your child paste them on the correct days of the week. You can then hang it next to your family calendar or in their bedroom so they can always review it and remember what they are going to do depending on the day of the week. Sometimes I wonder: where did my money go this month?! I’m sure it’s a common issue. 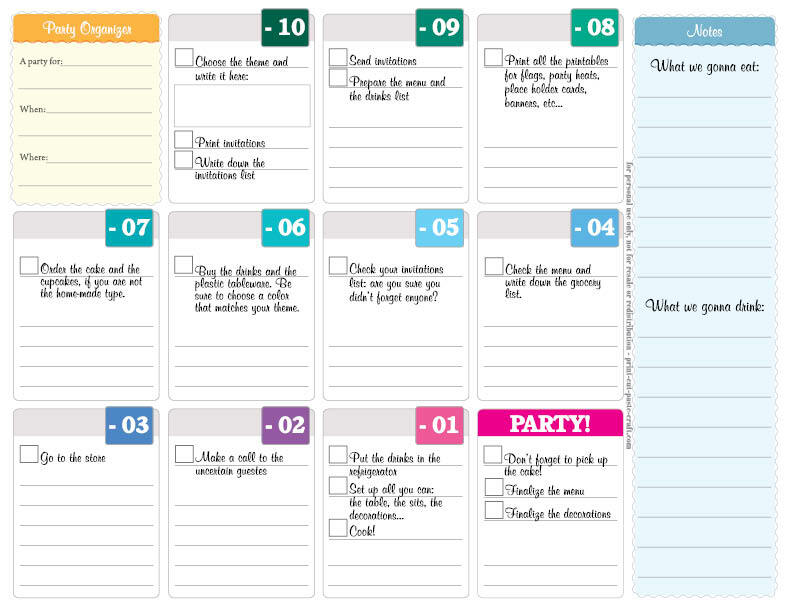 To help manage my expenses, I designed this planner. I collect all the the past weeks in a folder, so I can review my out-coming and take it under control. Click on the image to download the printable pdf for free and for your personal use only. 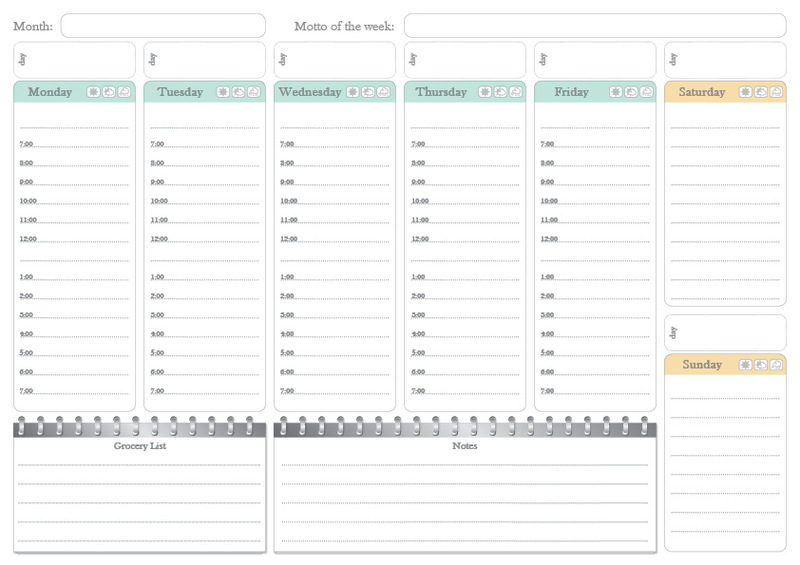 This is just a weekly planner I use to keep on my board. It doesn’t do any miracles, but it helps.